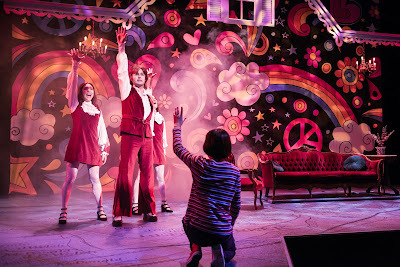 Erin Kommor (left) as Medium Alison, Lila Gold as Small Alison and Moira Stone as Alison. Presented by TheatreWorks Silicon Valley, this memory play also explores her complex relationship with her father, who, she eventually learned, was gay, too, but deeply closeted. 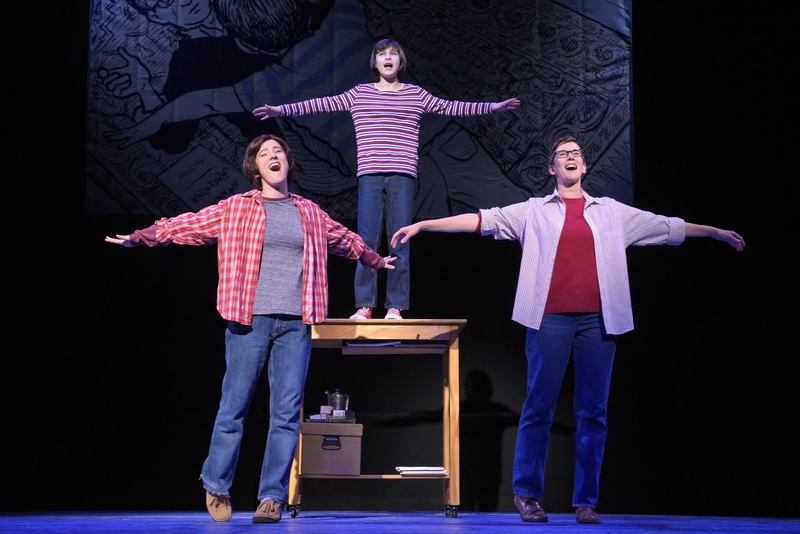 It shifts back in forth in time as the protagonist, Alison Bechdel (Moira Stone), a successful cartoonist, recalls her experiences as Small Alison (Lila Gold), about 10 years old; and Medium Alison (Erin Kommor), a college freshman. Alison’s father, Bruce (James Lloyd Reynolds), was a high school English teacher, meticulous restorer of the funeral home where they lived (set by Andrea Bechert), and funeral director in Beech Creek, Pa.
She had an older brother, Christian (Jack Barrett), and a younger brother, John (Billy Hutton). They had fun together, but their father could be alternately kindly and demanding. 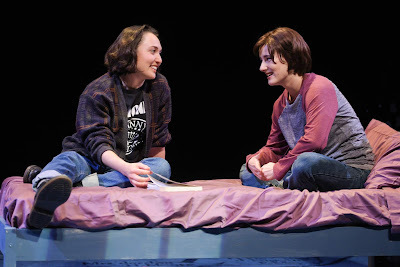 Joan (Ayelet Firstenberg, left) and Medium Alison (Erin Kommor) meet in college. Although there were hints that Alison could be gay – she hated wearing dresses as a youngster and was enthralled when she saw a butch UPS driver – it wasn’t until she was a freshman at Oberlin College that she came out to herself and had her first lover, Joan (Ayelet Firstenberg). In the flashbacks, Bruce’s own sexuality becomes apparent when he initiates contacts with former students (all played by Michael Doppe). There also is the time he took his three young kids to New York City and left them alone for a few hours at night, apparently to go cruising. His story ends tragically. Apparently unable to continue living a double life, he commits suicide by stepping in front of a truck. Much of the story unfolds in music written by Jeanine Tesori with lyrics and the book by Lisa Kron, who adapted it from Alison Bechdel’s graphic novel of the same name. TheatreWorks artistic director Robert Kelley directs the excellent cast, eliciting strong performances all around. Kudos especially go to the three actors playing the Bechdel children. Under the guidance of musical director William Liberatore, who conducts six instrumentalists from the keyboard, the singing is quite good. However, some of the lyrics aren’t always clear. Small Alison (Lila Gold, foreground) imagines a favorite TV show coming to life in her living room with (from left) Ayelet Firstenberg, Michael Doppe and Erin Kommor. Dottie Lester-White, associate director, choreographed numbers like “Come to the Fun Home,” the kids’ attempt at a funeral home commercial with a coffin as the centerpiece; and “Raincoat of Love,” the family disco number imagined by Small Alison as a favorite TV show. The lighting is by Steven B. Mannshardt, costumes by B. Modern and sound by Cliff Caruthers. This autobiographical show rings true and reveals just how much social attitudes have changed between Alison’s generation and her father’s. It’s well worth seeing. Running about 100 minutes without intermission, “Fun Home” will continue through Oct. 28 at the Mountain View Center for the Performing Arts, 500 Castro St., Mountain View. For tickets and information, visit www.theatreworks.org or call (650) 463-1960.